Wildlife tourists frequently fail to identify aggressive and distressed emotional states in wild monkeys – mistaking animals’ warnings of aggression for ‘smiles’ and ‘kisses’. This can lead to welfare problems for primates and risk of injury for people. 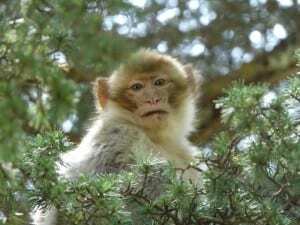 In our new paper we examined whether educational tools intended to help tourists recognise different facial expressions in monkeys – such as 2D images and information signs like those found in zoos or animal parks – were effective in reducing harm to humans and distress to primates in destinations where wild macaques freely interact with humans. We found that tourists made significant mistakes in interpreting macaques’ emotions – such as believing a monkey was ‘smiling’ or ‘blowing them kisses’ when they were in fact displaying aggression – despite exposure to pictures designed to demonstrate what the animals’ facial expressions mean. This level of misunderstanding could lead to increased risk of injury to humans and have a negative impact on the welfare on the animals, particularly in places where wild macaques interact with people, the study concluded. Our research suggests videos or supervised visits led by expert guides would be better placed to educate tourists about how best to read emotions in animals in zoos and wildlife parks, along with advice on maintaining safe distance from the animals. This entry was posted in Publication and tagged impact, research. Bookmark the permalink.